Many folk don’t realize it, but I’ve been writing Nikon-related books for twenty years now. Beginning in 2001, I went from traditional publishing to self-publishing. About the time of the D80 I also started a quasi-print-on-demand option that generated paper copies of many of my works. It’s been a long, wild ride for a one-man operation. I’ve personally and literally moved many dozens of tons of material from loading dock to warehouse to shipping to post office in the past decade. I’ll get right to the chase and announce what’s happening with my book operations. Later in the article I'll explain most of these changes in more detail. The book pages here on this site have been updated to reflect this, as well (see Books tab in black menu bar at top). I’m returning to eBook-only options, and specifically only downloads. No more physical products will be produced. Some older books are going away, as they don’t justify the time and effort to keep them up to date and available, even as eBooks. These older books include guides for the D40, D40x, D50, D60, D70, D70s, D80, D90, D100, D200, D1 series, D2 series, all the film cameras except the F100, F5, and F6, plus all the Fujifilm DSLR books. New books are indeed coming. A D600/D610 second edition will appear later this week, and a D7100 book should be introduced late next week. I will only document higher end cameras in the future. Current plans are for books on the D7200, D750, D810, and D4/D4s later this spring and summer. But basically the future of my books will likely center on D7xxx, Dxxx, and Dx cameras only. A few books are temporally in limbo. To get them ready for download-only, I have a bit of work to do on them. They’ll appear soon (F6, D300/D300s, D700, D3/D3s/D3x). The Introduction to Nikon Software book is going away. Nikon’s moved to new software that I no longer recommend. I’m debating what to do about this. I’ve been working on a workflow-oriented book, but right now it is mostly just a series of sketches, not something near being finished. Yes, I’m still trying to finish a general photography book. A very different book than you’ve seen anywhere before with very different ideas in it. It’s almost completely written at this point, but it still needs some refinement. When it’s ready, It’ll appear. Before getting into the details, I should probably explain why things slowed down in the past year or so. Basically three things: (1) the tool I use to create the books was hitting its limits; (2) I wasn’t 100% sure which direction I wanted to go (I could find a publisher and return to the traditional route very easily, I’m sure); and (3) I’m past retirement age now, so I’m simply not working as hard as before. The good news is that #1 has been solved and #2 decided. Can’t do anything about #3 ;~). The tool I use is Nisus Writer Pro. With the D800 book I hit the limits of this software, indeed, probably exceeded them. Basically, it was a 32-bit word processor (most still are). The problem is that all the graphics, layout, cross-referencing, and other things I do in my books were pushing Nisus Writer Pro right up to the maximum number of bytes it can consume. That was despite only referencing graphics, not embedding them. As it was, to get the D800 Guide out, I had to lower the size and quality of several pieces of graphics, because a couple of those referenced graphics put Nisus over the top and out of memory. And no, Microsoft Word and the other alternatives are not better choices. Try Nisus Writer Pro and you’ll find out why. Fortunately, Nisus heard my and other writers’ pleas. Even though it “isn’t a feature” per se, they prioritized 64-bit over a number of other things they could have spent time on, and I’ve been using a nascent release of the 64-bit version since it got stable (it’s now been released). The really good news is that this now enables other tools I’ve wanted to use, but couldn’t. For instance, the D600/D610 Second Edition will have an automated Index at the back. #2 took some soul-searching (mostly because of #3). I could just write and pass all the other chores involved with the book business onto a traditional publisher. But that would also delay most books to market by months, too. In the end, I decided to work a little harder in the near future and try to get things back to where they should be. Hopefully Nikon won’t be too prolific in the near future, as well. Okay, on to the specifics for those of you who want them. A lot of folk were originally surprised that I only offered eBooks as physical objects (CDs). There was a very good reason for that: I really wanted my eBooks to be treated as much like physical books as possible, and to retain value beyond the initial customer. Downloads basically require a license agreement that can’t be passed to another customer. If you buy a CD, you can sell that or give it away when you’re done with it (as long as you keep no copies). Those of you lamenting that a bunch of my older books will no longer be offered new should note that you might be able to still find them on eBay. Indeed, those of you with older versions you’re no longer using now will discover that what you have still has some residual value, which a download-only version will not have. I noted that I’ve moved dozens of tons of physical goods around. I’ve tried very hard to be as earth-friendly as possible in doing this. I used local sources to create my products, trying to keep shipping of heavy paper and plastic to a minimum. I used recycled materials where possible, and recycled all waste. Still, when you live at the center of tons of materials moving around and then you notice that your own consumption of books is mostly virtual these days, you have to wonder whether you’re doing the right thing by the planet. The argument that paper is better than electronic readers I don’t think still applies as it did back in 2001 when I started producing eBooks. The display of a basic Retina iPad these days is dramatically better than I can match using print-on-demand technologies with paper. Heck, my D3/D3s/D3x Guide printed weighs more than my iPad Air, so you can’t even say that it’s easier to hold the paper version any more. While I think we lost something in the transition from physical goods to virtual, I still think it’s time to bite the bullet and go all electronic. Thus, that’s exactly what I’m doing. I’m one person. Hiring someone to do all the work necessary to make the older books download-ready isn’t viable due to the extremely low volumes they’d sell at. Unfortunately, one of the side effects of the rapid iteration of DSLRs is that most of the older ones are disposed of or forgotten now. Sad, but true. Basically, this is a balancing act for me. Balancing my time moving forward with what makes sense to do. I don’t have the time and energy to do everything, so I won’t, simple as that. I really dislike this ephemeral world we’re transitioning to, but it’s one we need to get more used to. My advice to you is to get good about keeping your virtual and downloaded bits organized, backed up, and moved to new platforms as they come out. Yes, it’s been a long time coming. I noted above the issues I was having with 800+ page books being created by my tools. But I did continue to work on things where I could, and I’m not as behind as it might seem. Later this week you’ll find a second edition of the D600 book available, which now includes the D610 (and all the grief over the dust/oil issues of the original). The text has been given another go over, URLs updated where necessary, the wireless option covered, and an Index added, as well. If you own the first edition of the book, you’ll be getting an email with a coupon for a low-cost update. If you bought the D600 book in the last 30 days or so, you’ll be getting a free update. It might take me a bit to get those coupons out to all of you, so please be patient. Meanwhile, the D7100 book is mostly finished, but needs some final proofing, styling, and checking. It should be out next week. This is probably the point to talk about second editions versus new books. The D7000 and D7100, while very similar cameras, have a lot of differences. I’m not going to do the thing I did with the D3/D3s/D3x book again: there were just too many places where you had to pay attention in that book based upon which camera you had. Too many exceptions, differences, and nuances between those three models. The D600 and D610 have virtually no differences. At least on the outside. And almost no differences that change anything I write about image quality, and other important matters. Thus, it made sense to just pull the D610 into a complete update to the D600 book to a second edition. How about the D810? Well, it’s going to have a separate book. There’s enough different that I don’t want to get into the “if you have model X, then...” game in the text. Especially since the D800/D800E book already had a fair amount of that in the image quality sections. Over the years, many of the questions I’ve gotten from things I wrote in my books were associated with model differences. The D810 is just enough different than the D800/D800E that I believe it needs its own book. 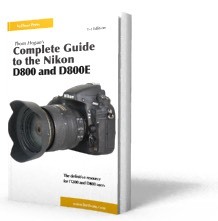 As with the D600 book owners, I’ll offer update options for D800/D800E book owners when the D810 book comes out. No, I’m not yet sure what I’m going to do about the D4/D4s. Probably both in the same book, but I’m still evaluating. My hope is that I’ll be popping the D750, D810, D7200, and D4/D4s books out one by one on a fairly regular basis between now and the end of the summer. My priority is going to be on the first three, though. This one was easy: that’s what you’ve been buying. I suppose I could target lots of new low-end customers who don’t know about me, but frankly one of the most enjoyable parts of my Web-based business of the past 14 years has been that I’ve done virtually no marketing. People who need me find me (and thank you for recommending me and my works to others, by the way). After decades of my career having to play marketing wars, it’s a relief to just let my works stand for themselves. I regularly survey site visitors, and I track all the email I get from the site. Even those of you who buy the low end consumer Nikon DSLRs (e.g. D3xxx, D5xxx) tend to be pretty sophisticated shooters. It’s not the “new-to-DSLR” user I tend to get for my books, it’s the person who wants to know every last thing there is to know about their more sophisticated camera, and especially nuances that changed from their previous sophisticated camera. So I’m just going to stay in that niche for the time being. Especially because I’m behind in offering books on those cameras. The D300/D300s, D700, D3/D3s/D3x, and F6 books are in limbo at the moment. In the case of the F6, since it’s a current camera still I decided to produce a “final edition,” and there was a lot of work to do to get that book up to my current standards. (Oh, I didn’t mention that? My standards have gone up with every book I produce. If you look at the very first ones I did to the current ones, you should see substantive growth, coverage, and clarity.) I’ve got some more work to do on that before it’s ready, so it’s a bit like the other new books: sometime between now and end of summer. Those older DSLR books need some work, too, though not nearly as much. It’s actually pretty tricky work, as a lot of URLs in them have gone bad, plus other bits and pieces need a touch-up. I considered offering them as-is, but I think it better if I trim them up and make them better first. Within a week: D600/D610 second edition, D7100 first edition, plus F100 and F5 books back up and active. Coupons to D600 book owners. Early/Mid June: another book posted, hopefully the F6 book redone, too. By the end of the summer: D750, D810, D4/D4s books posted. Unknown, but sooner rather than later: D300/D300s, D700, D3/D3s/D3x books posted. This email list will be used only to announce new books or changes to a books status. No marketing spam.